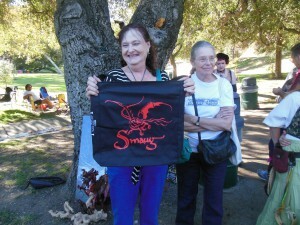 TORn’s LA staffers hosted their 11th annual Baggins Birthday Bash today in Griffith Park. We’ve always held it here, but have been a couple different positions over the years. Today, we moved over to the Mineral Wells area, past the Harding Golf Course, and it finally afforded us some much needed room, since the party has been expanding the past couple of years. 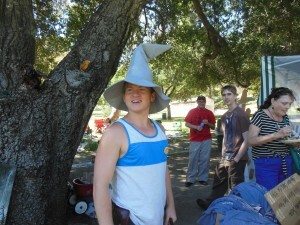 There must have been close to 150 folks eating, drinking and having a Tolkien Good Time. The design motif this year was definitely Dragons and Spiders, we had spiders all over the cake and cupcakes, they were on every table, in the trees and all over the food tent. But there were also dragons, also on the tables and in the trees, but it was Smaug sitting on his pile of gold that got the most attention. You may not be able to notice it, but there are some jewels under his belly in this image, look closely and maybe you will see them. Nothing remains of Smaug, he was desolated when one child ate his head and another ate one of his wings. Someone else asked for a foot, no word on what happened to the tail. 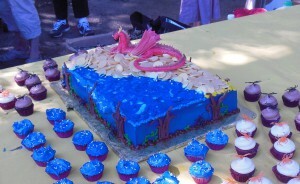 There was plenty of Dragon Gold to go around as well, thanks to Wonderland Bakery and their amazing cake designers. 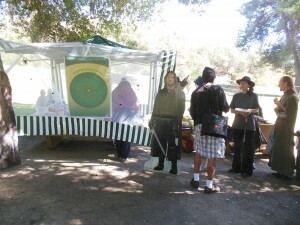 Many games were played, including everyone’s favorite Hobbit game, Golfimbul. 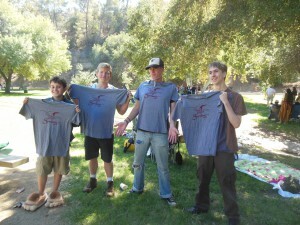 Prizes of Hats, Bags and Shirts were given out to winners of Golfimbul, both in the Adult and Youth divisions. There was also a very interactive Trivia game contest, two rounds, to determine who knew their Hobbit material best. There are only a few images here, check out the facebook page to find the Baggins Birthday Bash photo album to see the rest. In the crowd, you will notice many Hobbits, Elves, Dwarf women and Gandalf, among other Middle-earth notables. Yes, we will be hosting this party again next year, so if you find yourself in Los Angeles the weekend of Sept. 20/21, look for the Party Sign and party like a Hobbit, or Dwarf, or Elf, or even a Wizard or two.